While fire monitors spend the vast majority of their lives motionless and inert, when the call to action comes, their effectiveness can easily be all that stands between recovery and disaster. Far from being ancillary equipment, they are a 'front line' firefighting resource in volatile high-hazard environments. Peter Kristenson explains. In essence, there are two types of fire monitor. The fixed monitor is a static appliance that is attached permanently to pipework and is positioned to stand guard over a specific fire risk, while the mobile monitor is most frequently employed to protect a multitude of fire hazards. 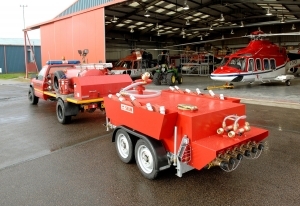 As the term 'mobile' implies, they are trailer-mounted for fast deployment around the site so they do require a water supply, which is usually provided by hose connection to a hydrant or portable pumps. The decision to install fixed monitors or opt for mobile equipment is not as straightforward as it may first appear. Undeniably, a fixed monitor has the potential to be brought into action on a particular fire risk faster than a mobile unit that has to be moved and connected to a water supply. However, a major petrochemical fire, for example, is often preceded or accompanied by an explosion with the potential to disable or destroy the fixed equipment before it has even had time to spring into action. So dependency on fixed monitors can be a high-risk strategy. Conversely, reliance on mobile monitors inevitably means some delay before firefighting can commence. It is also imperative that all of the site's possible fire scenarios are carefully assessed so that this delay is not extended while, for example, the most effective positioning of the monitors is determined. This requires careful fire planning to take into account the throw characteristics of the monitors, the proximity of hydrants, the need for hoses or pumps and possible wind conditions. Planning and training, therefore, are not options - they are essential. Frequently, the best solution is a combination of fixed and mobile monitors, with fixed appliances acting as the first line of defence, and mobile monitors used to protect bunds, deal with fuel spillages and vapour concentrations, and to cool adjacent fire risks. Monitors can be operated either manually by the firefighter or be remotely-controlled. Remotely-controlled monitors enable the firefighter to operate the equipment at a safe distance from the fire, moving the monitor in both the horizontal and vertical planes and, on the most sophisticated units on the market, adjusting the flow, stream pattern and throw. Power is hydraulic or electric. Each system has its particular benefits and leading equipment manufacturers offer hydraulic and electric options, as well as both manually-operated and remotely-controlled monitors. Electric remote control can be supplied with explosion-proof EEx (e) and flameproof EEx (de) electrical equipment in accordance with ATEX (ATmosphères EXplosibles) guidelines for when the monitor is likely to be used in areas that may be exposed to explosive gases. These ATEX guidelines apply in Europe and are similar to the USA's NEC (National Electrical Code) guidelines. Monitors need to be robust, unerringly reliable and deliver their promised performance at a moment's notice. The jet reaction force of a monitor can be considerable, so monitors need to be securely restrained so they remain 'on target' when in operation. A trailer-mounted monitor depends on the stability of the trailer unit, which may incorporate stabilising outriggers. Some have integral water tanks that increase the trailer's weight and provide additional stability. Other considerations when selecting a monitor include compactness of the monitor, a balanced design for improved performance and - particularly for portable and manually-operated monitors - light weight and the incorporation of low-friction bearings for easy manoeuvrability. The current SKUM FJM range embraces portable, oscillating, manually-operated, and remote hydraulically-operated and electrically-operated fog/jet, water/foam monitors. Most are FM (Factory Mutual) approved and certified by DNV (Det Norske Veritas), Rina (Registro Italanio Navale), and BV (Bureau Veritas). The FJM-P portable monitors deliver up to 3000l/min (litres a minute) and are available with the option of dual connection, automatic oscillation and a built-in foam inducting nozzle. The manually-operated, self-oscillating FJM-WTO monitors are available with capacities of 3700l/min, 6000l/min and 11700l/min. The WTO S models incorporate built-in foam induction, and depending on the model and capacity, the range of the WTO monitors is between 75 metres and 90 metres plus. These capacities and throw lengths are extended in the manually-operated SKUM FJM-MAN monitors, where the maximum capacity is 20000l/min and the maximum throw is over 120 metres. 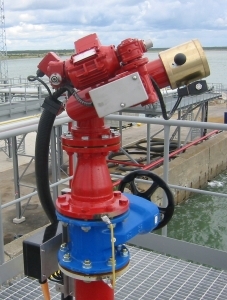 The FJM-FJF monitor has a manually adjustable nozzle for flows from 5000l/min to 20000l/min; a performance that is mirrored by the FJM-SLN, which has an automatic nozzle. The two remotely-controlled monitors are the hydraulic SKUM FJM-H and the electric FJM-EL (Fig.1). Both include a manual override option. The FJM-H has capacities of 6000l/min and 11700l/min, with a maximum throw in excess of 90 metres. However, it is the remotely-controllable FJM-EL fog/jet monitor range that is proving to be the most popular. The FJM-100 EL has a built-in inductor option and delivers up to 6000l/min to a maximum jet throw of 80 metres, while the FJM-150 EL increases this to 11700l/min to a distance just over 90 metres. The top performing FJM-200 EL further increases the reach to 120 metres and the flow to 20000l/min. Optional components include a control and operating panel, which can be either the standard FJM model or be custom-built, suction hose and valve, and explosion protected EEx (e) and flameproof EEx (de) electrical equipment. One of the latest monitor offerings on the market is the new RAFT Rapid Response Foam Trailer that is designed to be highly mobile, versatile and cost-effective (Fig.2). It can be fitted with either the FJM-80S or the FJM-100S manual fire monitors and is available as a single-axle 1000litre tank capacity unit, and as twin-axle 1800litre and 2300litre capacity trailers. Both of these monitors are constructed with built-in foam concentrate inductors to ensure reliable, accurate and adjustable proportioning between 1 per cent and 6 per cent for all types of foam concentrate, eliminating the need for a separate proportioning system.